That's right. 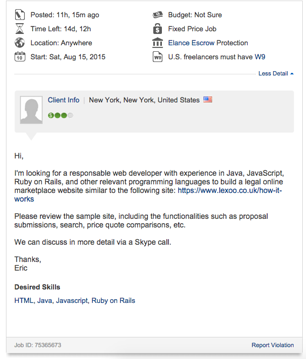 Someone wanted to commission a freelancer to COPY LEXOO - (in Ruby on Rails no less!) They say that imitation is the highest form of flattery! In response to all these elancers visiting our site to copy it, I pushed up an alert that would only show for visitors who came to our site via this job posting. Postscript: I'd like to know how much the winning bid was. I mean, how hard could it be to just build Lexoo? If I did it, surely anyone could! Double postscript: every day we've been getting fake enquiries through Lexoo from elancers testing out the system to see how it works. It's now starting to get a little annoying! Quadruple postscript: Dom Mason pointed out that these components are called Welcome Mats. Thanks Dom! Host your own blog? Stuff that.